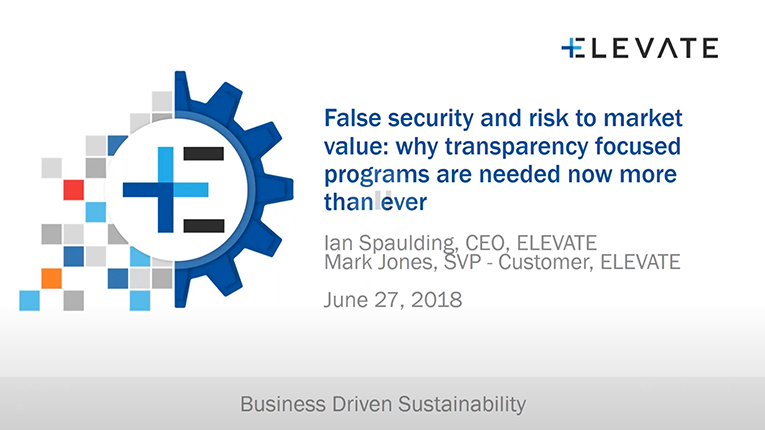 ELEVATE CEO Ian Spaulding and SVP Mark Jones explore the coming investor data requirements around supply chain and factors to consider when adopting mutual recognition. So much of the social responsibility role is about effective analysis and reporting of information. At a basic level, the CSR professional wants to report about audit program performance. Have those factories audited every year demonstrated improvement? For those new factories, are we helping them onboard and improve faster than in previous years? Looking at our portfolio of factories, what is the overall level of compliance? Is it showing greater impact than one size fits all audit? Are your factories realizing an ROI from their investment in factory ownership? How are the relative levels of social responsibility contributing to the supply chain cost advantage? With the sudden emergence of mutual recognition at the same time investors are beginning to intensify their due diligence and information requests on supply chains, CSR professionals are faced with an interesting inflection point. Can they rely on data collected from mutual recognition to support the more granular investor needs going forward? Join Ian and Mark as they share insights into how developments in the investor markets will change the questions you need to answer for senior leadership and how and where you source that information.